Monmouth University unveiled the completion, remodeling and expansion of its science facility in a celebratory ribbon-cutting ceremony on Tuesday, Feb. 13, 2018 in the expanded lobby of the Edison Science Building. 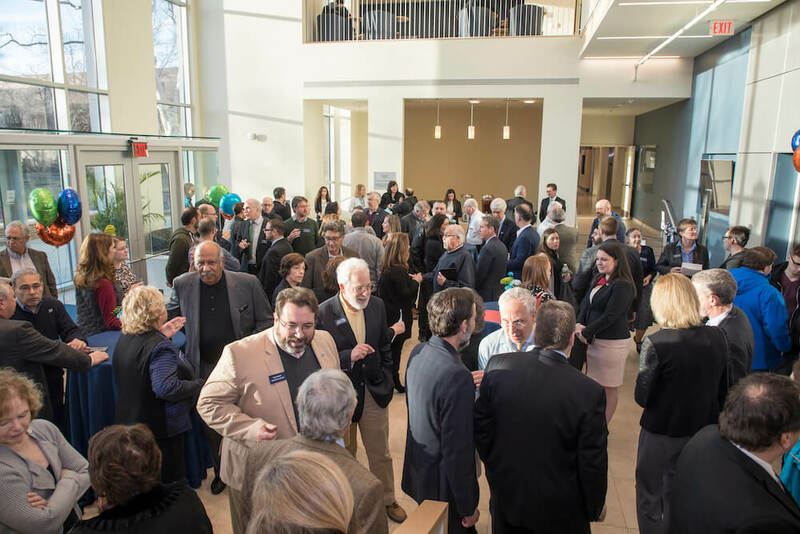 Special guests, including state leaders, elected officials, business and community leaders and members of the university’s Board of Trustees joined University President Grey Dimenna and Dean of the School of Science Steven Bachrach as they officially opened the completed renovated facility. Among those in attendance were Sen. Vin Gopal, N.J. State Senator from the 11th District, Eric Houghtaling and Joann Downey, N.J. State Assemblypersons from the 11th District, Janet Tucci, Mayor of West Long Branch, N.J., and Rochelle Hendricks, N.J. State Superintendent of Higher Education. Board of Trustees Chair Michael Plodwick and former chair Henry Mercer assisted with the ceremonial ribbon-cutting. Guests gather in the new lobby of the Edison Science Building to celebrate the completion of the expansion and renovation of the university’s science facilities on Feb. 13, 2018. 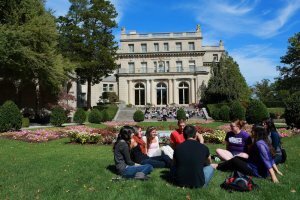 The science building project benefitted from $5 million in state funding through New Jersey’s Building Our Future Act and the state’s Capital Improvement Fund. 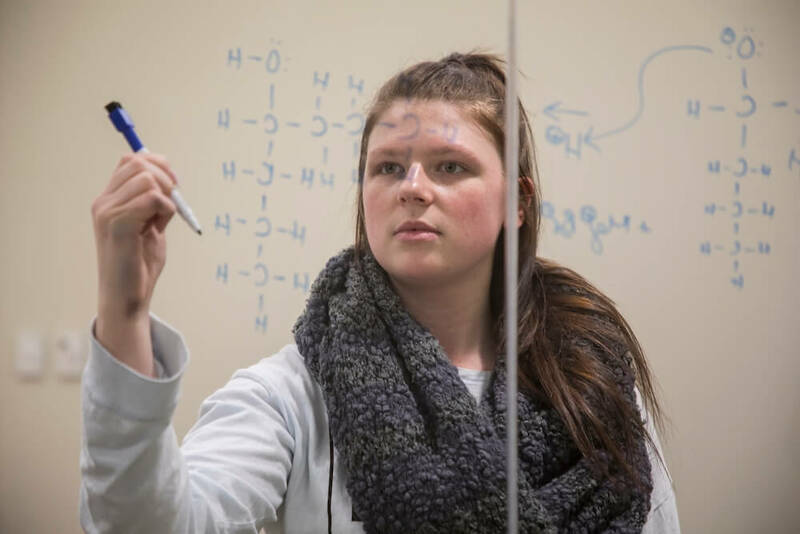 A Monmouth University student works through a formula in one of the new laboratories in the renovated Edison Science Building. 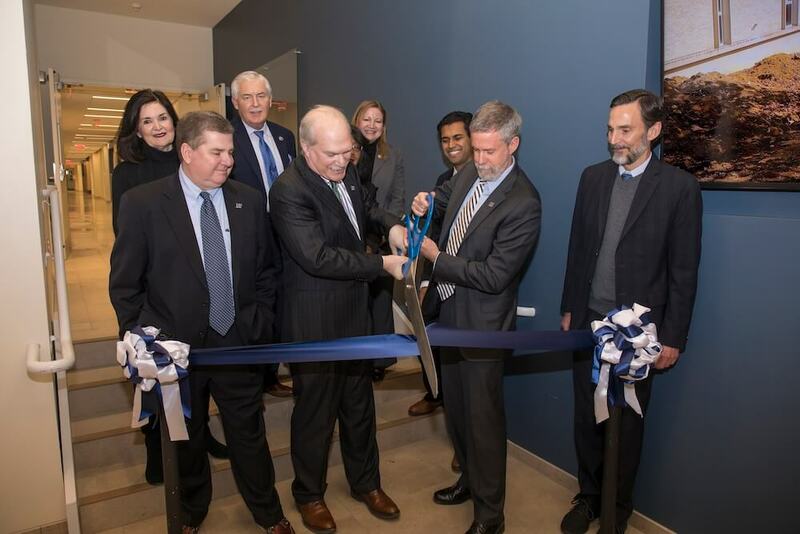 School of Science Dean Steven Bachrach and University President Grey Dimenna cut the ceremonial ribbon officially opening the renovated and expanded Edison Science Building at Monmouth University on Feb. 13, 2018. 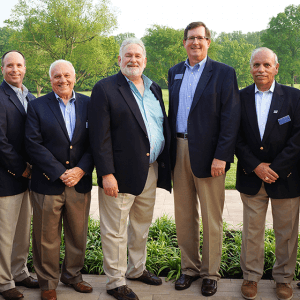 Board of Trustees Chair Michael Plodwick (l) and former Board Chair Henry Mercer, III, flank the pair. They are surrounded by (l-r) West Long Branch Mayor Janet Tucci, State Assemblyperson Eric Houghtaling, Superintendent of Higher Education Rochelle Hendricks (partially obscured), State Assemblyperson Joann Downey, and State Senator Vin Gopal. 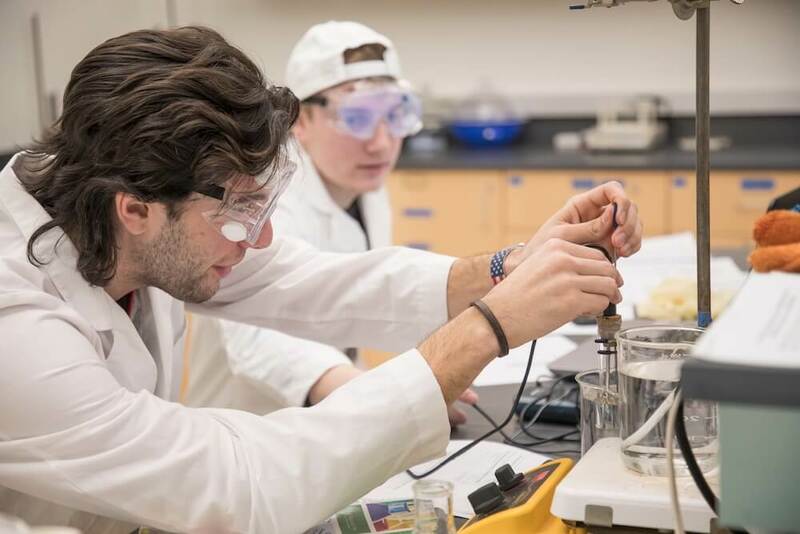 Students work on an experiment in the General Chemistry Laboratory in the renovated and expanded Edison Science Building at Monmouth University. All photos by Anthony Deprimo.